In Laos, i wished i could decipher the Laotian letters on the license plates, and then occasionally i saw blue license plates with Roman letters and Arabic numbers. 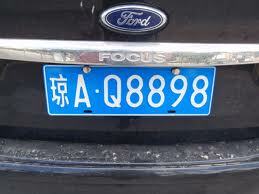 These, it turns out, are cars from China, and the more i looked, the more blue license plates i saw. The majority of tourists in Laos are Koreans and most of them are on tour buses. I was traveling with 5 neighbors, and we always hired a car and driver to take us from one place to another. Our neighbor, Connie, who was there for work, and who speaks Lao, says Lao is the West Virginia of southeast Asia. Six million people living in the mountains that the Ho Chi Minh Trail ran through. It may be only 240 miles from Vientiane to the Plain of Jars, but it took us seven hours to drive there. It’s another 160 miles from the Plain of Jars to Luang Prabang and took another seven hours on a road that had a curve every tenth of a mile, going downhill to bridge every river, and uphill to cross every pass into the next valley. Our driver passed innumerable logging trucks hauling sizable teak logs that had been illegally logged by the government. Half of the cars on those twisty roads had blue license places. How far away was China anyway? One Chinese tourist told us she had driven 2,000 kilometers in two days. I don’t know what the roads look like in China, but Laos is not a place for speeding. The deluge of blue license plates continued in northern Thailand, around Chiangmai where there are 4-lane highways with median strips full of bougainvillea. Miles and miles of bougainvillea. 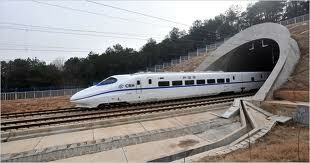 I heard that China will soon be building high-speed trains into Myanmar and Laos, The high-speed trains from China to Burma and Laos will zip thousands, h undreds of thousands, (dare i say millions?) of Chinese into southeast Asia. Myanmar has a population of 60 million. How long do you think it will take for Chinese immigrants to overwhelm Laos with its population of 6 million? The more populous Myanmar will take longer. The Chinese are brilliant, really. No military might required. Just send in the tourists and the immigrants until the southeast Asian states become virtual vassal states of China. This entry was posted in DHARMA REFLECTIONS and tagged Burma, China, high-speed, Laos, Myanmar, Thailand, Train on March 20, 2013 by cherylwilfong.